While trends say the deer is the big hunt of the season, the not-as-trendy dachshund still ranks high on my list due to overall cuteness factor. Who wouldn't love a perky dachshund as a friend? While browsing Patina this morning, I came across a few cards sporting these perky pups and I couldn't resist posting these because both are quite cute. I love the thank you notes because they remind me of those flash cards from grade school or the images on a deck of playing cards. Retro and orange? Hard to resist. 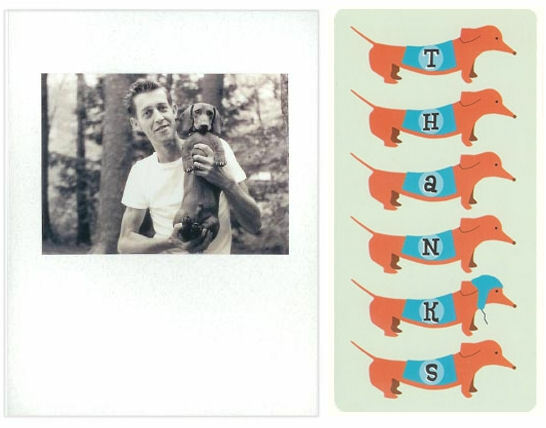 Then there are the cheeky wiener cards, a definite must-buy for your favorite guy pal simply because of the message inside "There he goes again showing off his wiener."